As Merlin Holland once put it: in Victorian times it was beyond the pale to be a convict, a homosexual, or a bankrupt, and Oscar Wilde was all three. Which prompts the question: what happened to the plays when the most successful playwright in Britain went to prison? 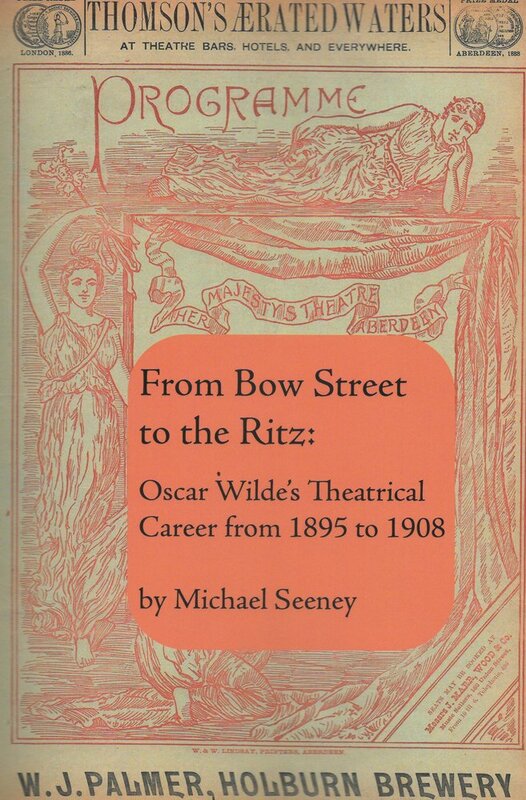 The answer can be found in Michael Seeney’s new book From Bow Street to the Ritz, which was launched at the Festival. Seeney is a knowledgeable Wilde scholar has been a central contributor to fin-de-siècle studies in the UK and beyond for many years. His latest offering provides a self-styled pointilliste approach in which he demonstrates, in a literary sense, how small, distinct points can be applied in patterns to form an image. The points depicted form an in-progress chronology of the major productions of Wilde’s plays that were performed across the world in the years after he was sent to prison. The work is valuable because conventional lack of wisdom assumed that Wilde’s plays were not performed until much later owing to the scandal attached to Wilde’s name. However, Seeney knows that it pays to be skeptical in an era of digital research, and he has discovered that Wilde’s plays not only continued to be performed throughout his prison term, but also that they flourished well beyond. The record is rounded out by astute Wildean context, engaging theatrical anecdote, and detailed period data resulting in an image, like an uncovered work of art, that did not to exist before. Many authors have focused, as Oscar Wilde did famously himself, on the fabled dramas that continued despite the threat of prison; but not until now has anyone given us the literal dramas that continued despite the actuality of it. It is a welcome addition to Wilde scholarship. Niall and Maite of At It Again Dublin were on hand at the Festival to introduce their latest pocket-sized book. Romping through Dorian Gray is the third in a series of pocket guides that playfully provide an illustrated and concise guide to works by famous Dublin authors. After taking on Ulysses and Dracula, it is now the turn of Wilde’s The Picture of Dorian Gray. The broad brush format necessarily places the idea at the other end of our artistic metaphor—however it is no worse for that. Pleasingly, the books are not simply crib notes or shortcuts. The authors arm the reader with insider tidbits, essential quotes, and related activities, for a literary adventure complete with original illustrations and maps that bring the story, and indeed Dublin itself, to life. Thank you, John. I’m glad Dublin has been brought to life. James Joyce would be so happy. All the best, Peter Good job, as always – makes one want to read these books. Thanks John. I appreciated the info.